Wet sandy or peaty places: moist forests, high shrub zones and borders of bogs, boggy thickets, hummocks in fens, often with tamarack and poison sumac; rarely in drier oak or oak-hickory forests. Herbarium specimens for which the collector neglected to note the stature of the plant can be difficult to identify if the leaves are immature, for the habit of the plant and the size of the mature leaves are the best distinguishing features. Specimens with flowers but immature leaves may be distinguished from Vaccinium myrtilloides if the leaves are glabrous and/or serrate, from V. angustifolium if the leaves are entire or strongly pubescent, and from V. pallidum if they are green beneath. Unfortunately, some specimens of V. corymbosum may not be distinguishable on these grounds, and little but flower size can be used to separate herbarium specimens with inadequate notes from those of lowbush blueberries. This is a complex species, and some of our hairier plants, well represented in collections from the southwestern Lower Peninsula, are apparently the var. atrococcum A. Gray (Vaccinium fuscatum Aiton). These may be nearly as hairy as V. myrtilloides, but are much taller, with larger leaves and flowers. Hybridization with lowbush taxa (producing “half-high” shrubs) is suspected. 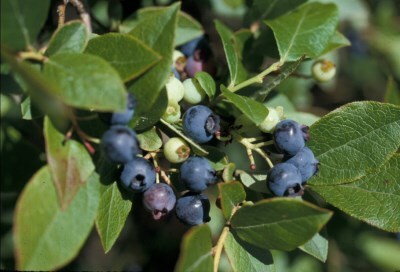 Rare putative hybrids have been collected as far north as the northern Lower Peninsula, beyond the range of "typical" Vaccinium corymbosum. MICHIGAN FLORA ONLINE. A. A. Reznicek, E. G. Voss, & B. S. Walters. February 2011. University of Michigan. Web. April 21, 2019. https://michiganflora.net/species.aspx?id=1233.